Islamophobia is back again in British politics. More frequent attacks on mosques and gradual, growing support for far-right groups reminds us that anti-Muslim feeling is on the increase. The perspective on Islam has changed since 9/11, it is simply not so easy anymore for Muslims living in the West. Britain has always been one of the most tolerant countries to live in, nobody wanted to be called a racist living in a British society. People had a liberal approach towards other religions and ethnicities, in fact immigration was made very easy in the 60s to make up for the lack of educated professionals and labour force. 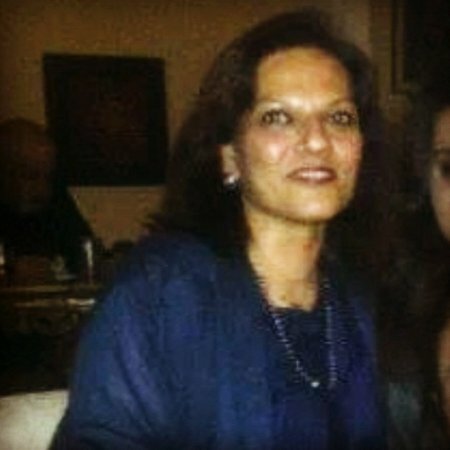 Doctors from India and Pakistan worked in the NHS, the government health service, and helped make it a success, similarly in other professions the immigrants made a significant contribution. British people generally take pride in their liberal and tolerant outlook, but gradually, attitudes are undergoing a slow, silent change as terrorism increased in the world, 9/11 in particular exacerbating this change of attitude. 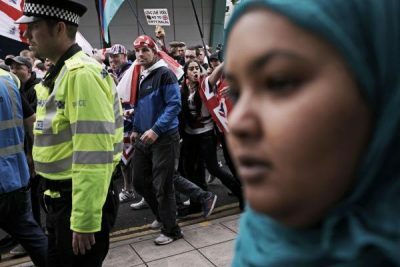 In today’s Britain, parties like UKIP or smaller groups like the EDL or Britain First have signalled a retrogressive downslide in British society. In Scotland, there is the SDL, another far-right group. The UKIP is the largest party in this category, most of its supporters are conservative, distrustful of the government and inclined towards tougher attitudes towards immigrants, the annual British Social Attitudes Report found. More than two thirds of UKIP supporters said they believed migrants from outside the EU should never be eligible for welfare benefits. “The Muslims are breeding ten times faster than us,” said UKIP peer and former leader Lord Malcolm Pearson in 2009. “We see large and growing Muslim communities which are set against integration with the rest of us. We see thousands of home-grown potential terrorists,” Lord Pearson reiterated in 2013. Senior UKIP member of the European Parliament Godfrey Bloom is recorded on film in 2013 criticizing aid being sent to “bongo bongo land”. In 2014, UKIP candidate William Henwood tweeted that comedian Lenny Henry “should emigrate to a black country” and compared Islam to the Third Reich. UKIP councillor Chris Pain was forced to resign in 2013 after his racist Facebook posts became public knowledge. He had written that immigrants are “free-loading, benefit-grabbing, resource-sucking, baby-making, non-English-speaking…bomb-making, camel-riding, goat f— …” and also that there were “too many Muslims” in the UK. The UKIP is overflowing with racism and it can be called a party of extremists. It is incredible that they find supporters and a voter base. Britain First is another highly publicised group, and with twenty million followers on Facebook alone, have a slick social media campaign. Recently, they posted a photograph of a funeral in Birmingham. In it thousands of Muslims are saying their prayers. The deceased was a World War 2 veteran who was also a religious personality. Supporters of the Britain First page commented that they wanted to drop napalm bombs on mourners praying at the funeral. People criticised the far-right group for disrespect. 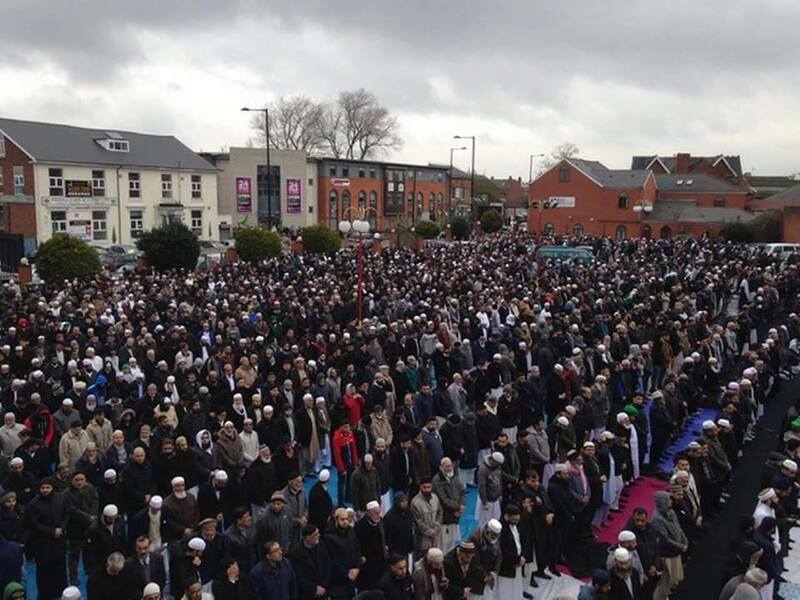 The funeral was of mosque leader Sufi Muhammed Abdullah Khan, who was the founder of the Central Jamia Masjid Ghamkol Mosque in Birmingham. Britain First made it to the front pages for its ‘invasions’ of mosques or driving military armoured cars to appear aggressive. Its ‘toughies’ initially soared to fame for loitering outside the East London Mosque in Whitechapel, pretending to counter the crackpot Anjem Choudary’s “Muslim patrols” with their own “Christian patrols”. Its simple messages against dog fighting, against child molestation and loving British soldiers attracted the public in general and their page on Facebook would ask people to click “like” if they were wore a poppy for Remembrance Day. This way it became Britain’s foremost political group on Facebook. Nobody knew what the group was or who was behind it, coming across like some popular street campaign. It was formed in 2011 by Jim Dowson, a Protestant preacher and former member of the British National Party as the English Defence League (EDL) and BNP had lost popularity. Dowson quit the group in 2014 claiming that he was shocked to discover Britain First was full of “racists and extremists”, after his workers started falsely collecting money for British heroes such as Lee Rigby. Since then Britain First has become the self-appointed ‘defence force’ of UKIP. The EDL tries to provide the exact anti-Muslim, provocative narrative that would push young Muslims into extremist religious Islamic groups. It is a very dangerous situation and needs to be watched. The English Volunteer Force is a small right-wing street protest movement, a splinter group of the English Defence League. This group calls for the halting of all Muslim immigration, prohibitions on the building of mosques and sale of halal meat, the rejection of multiculturalism, and rejection of what they call the ‘Islamification’ of Great Britain. The group plans to ‘Unite the Right’ which essentially means all these parties amassing resources to drive out Muslims. The EDL is reported to be developing links with right-wing elements within America. Florida pastor Terry Jones, whose calls to burn the Quran had provoked violence resulting in numerous deaths, was invited by the EDL to a rally in Luton in February 2011 “to share his views on Islamic extremism.” He was banned from entering the UK. The Canadian Jewish Defense League also held a demonstration supporting the EDL, announcing that the two groups will “take a stand against the forces of political Islam”. The EDL has established links to the Danish Defence League which is growing fast with 10 chapters in one year. The Norwegian Defence League is also a sister organisation of the EDL with strong links between the leadership of both, NDL members often travel to the UK to participate in EDL protests. According to The Daily Telegraph, Breivik, perpetrator of the 2011 Norway attacks claimed that hundreds of EDL folk are his Facebook friends and that he had links with senior EDL members. Breivik wrote online that he once attended an EDL demonstration in Bradford. In 2011, Interpol got Paul Ray, a former member and co-founder of the English Defence League investigated, he blogs under the name “Lionheart” and may have been Brievik’s inspiration. Journalists that have written about EDL marches and their inflammatory speeches have received death threats. Jason N. Parkinson from The Guardian wrote about receiving a death threat by email from an EDL organiser, death threats were also sent to Marc Vallée, a fellow journalist. The heavy policing of EDL demonstrations usually costs from £300,000 to £1 million. In May 2013, a poll by YouGov concluded that nearly two-thirds of Britons believe there will be a “clash of civilizations” between British Muslims and white Britons, and 34% believe that Muslims pose a serious threat to democracy. Verified data collected by Tell Mama (Measuring Anti-Muslim Attacks) on attacks on Muslim women accounted for 58% of all reported incidents by Muslims in the UK. Muslim school children in Britain are on the recieving end of a bullying and violence backlash, especially after the Charlie Hebdo massacre. There is a marked rise in Islamophobia in British schools and the government is helpless. A UK charity which monitors anti-Muslim hate crimes has recorded a “significant” increase in incidents in schools after the Charlie Hebdo killings in Paris, frequent verbal and physical attacks are taking place against Muslim students. Britain has a large anti-Islam propaganda machine, its print media and television media both have this anti Muslim slant. No chance is spared to put Muslims on the defensive, eg. once it was debated that Pizza Express might be “secretly” using halal meat in their stores, suddenly Muslims at all levels of society had to defend Halal meat even to those who hunt for fun. Being both British and Muslim is a potentially impossible identity in todays Britain. It is believed that a Muslim cannot be loyal to Britain if loyal to religion, is it ever going to be possible to assimilate and absorb into the British scene ? Will Muslims settled in UK ever be forced to leave like once Kenya had expelled all immigrants ? Every Muslim is seen as a possible threat, if a Muslim is somewhere at the wrong place, wrong time, the Muslim is nearly always responsible. Next post Co-operation between the Congolese army and UN must resume "as soon as possible"